With rising levels of malicious and criminal activity focusing on stealing business and consumer data, it has never been so important to have the ability to implement a security solution. Implementing network security is not only the sensible action to take, but it is also what’s required by UK Data Protection Legislation and Payment Card Industry Data Security Standards. Our Sentry solution is a fully managed security service that will protect your LAN environment from unwanted access and activity. It’s suitable for all sensitive data systems and has specific accreditations for card payment security because its PCI DSS Level 1 certified, the first in the world to achieve this. Our solution is delivered as a fully managed subscription based service so there is no need for you to invest in, software or additional personnel. The system will watch over your business day and night, monitoring all network activity and acting proactively to block threats. It delivers Enterprise level security but without high costs and complexity. 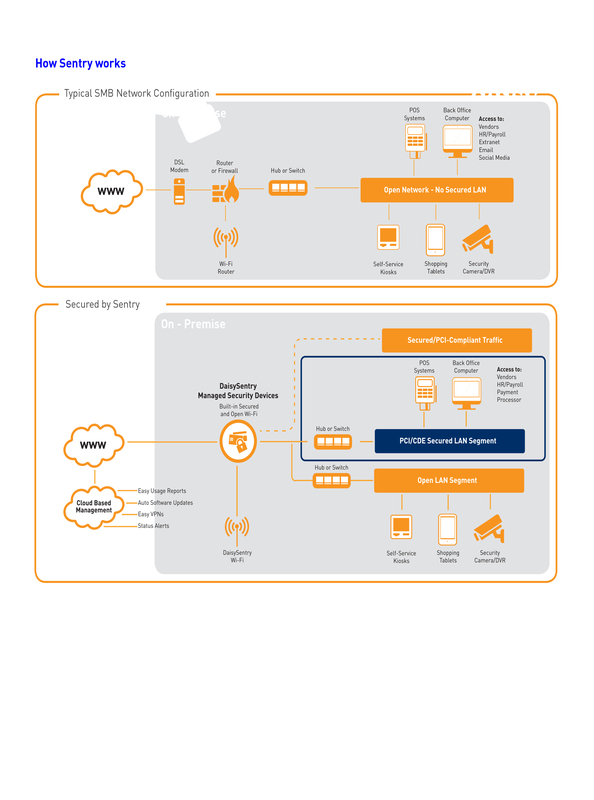 With Sentry’s powerful Central Management System, you can bespoke, deploy, manage and interrogate your security, usage and access for all fixed and Wi-Fi connections. All businesses taking card transaction have to be PCI DSS compliant and those processing over a data connection will require Sentry. Our service is Level 1 compliant and ‘certified’ by Verizon, a global PCI Qualified Security Assessor. This means it not only addresses a large part of the users PCI requirement’s, but also helps to protect from breach fines, something non-certified solutions can’t do.